The word Marais is often translated as "marsh," but this is rather misleading - a better term might be wetlands or water meadows. The Marais Poitevin has both types of environment, with lush green pastureland and lower-lying wetlands criss-crossed by shady canals. As you'll find out, there's so much to do and see here — from boat trips to hiking or biking, you'll be spoiled for choice when explore this delightful protected natural area, centred on the mediaeval town of Fontenay-le-Comte. This part of the Vendée is called the "Green Venice." 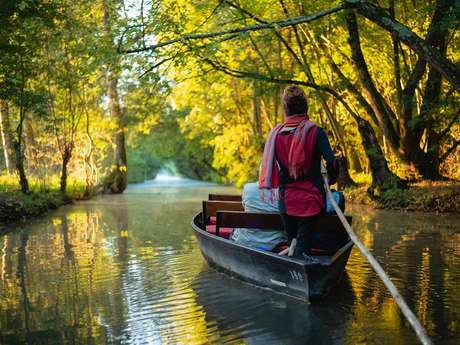 Located south of Fontenay-le-Comte, the wetlands canals are undoubtedly the busiest part of the Marais Poitevin. 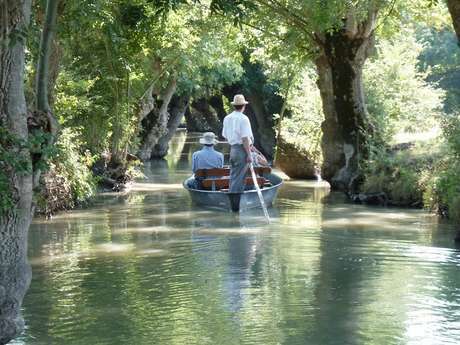 The waterways are covered by a green canopy of ash trees and poplars, a romantic and exotic getaway. Boats are undeniably the classic and best way to enjoy and discover the landscapes of the Green Venice. The silence and the mysterious atmosphere that emerge from the marais never fails to leave an impression. If you prefer to be independent, you can also rent a boat to visit the Marais Poitevin on your own - perhaps with the whole family. 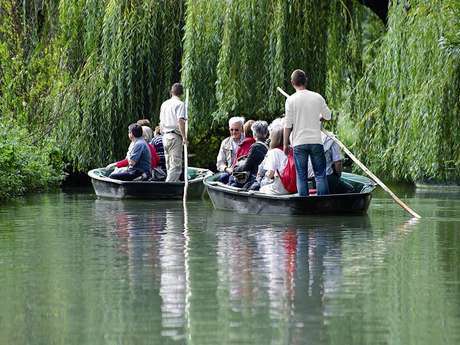 The first embarkment jetties in the Marais Poitevin are less than fifteen minutes from Fontenay-le-Comte, around Maillezais, Coulon and Marans. If boat trips are not your cup of tea, discover the marais on foot, by bike, on horseback - why not, by donkey! A few kilometers south of Fontenay-le-Comte, various circuitwalking and cycling trails are available. A three kilometre observation trail in the Nalliers-Mouzeuil-Saint-Martin Biological Reserve leads walkers to a meeting with purple heron and turtle doves. Take the opportunity to visit the Maison de la Reserve, a place of mediation in this protected area. It is one of the last examples of wetland forest in the area. From Le Langon, a cycling circuit embraces the Regional Nature Reserve of the Poiré-sur-Velluire marshland. Other circuits starting from Velluire, Auchay-sur-Vendée or Doix-lès-Fontaines allow visitors to discover another facet of the Marais Poitevin halfway between wetlands and drained pasture. Cycling enthusiasts will find bike paths throughout the Marais Poitevin. Greenways and bicycle routes help you discover the Regional Natural Park, from Niort to Marans, following the Vélo Francette® route. The drained wetlands, now low-lying dry pasture, extend west of Fontenay-le-Comte. They are protected from flood waters and tides by levees and dikes. Complementary to the wetlands, it has open landscapes with plains and hedges. Around Fontenay-le-Comte, discover the communaux, these great flood-prone natural meadows which in the summer are home to herds of grazing cows and horses. Don't miss the Regional Nature Reserve at Poiré-sur-Velluire.